The Liuhuaishan site is an important early Paleolithic site found in the Bose Basin. 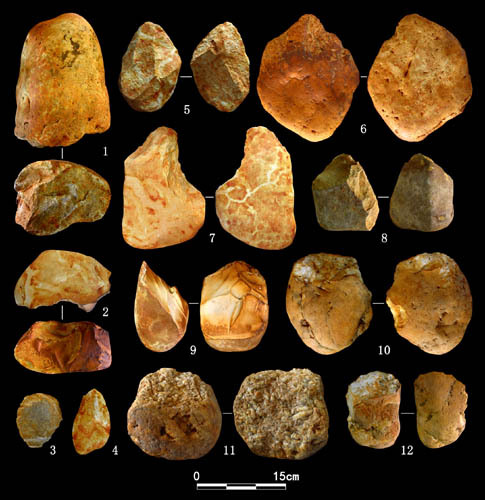 In December 2008, Scientists from the Institute of Vertebrate Paleontology and Paleoanthropology (IVPP), Chinese Academy of Sciences, and Youjiang Museum for Nationalities, Bose, carried out a short survey around this site and found three new Paleolithic localities with a collection of 37 stone artifacts. This new finds will help better understand the human behavior at open-air sites in south China, researchers reported in the latest issue of Acta Anthropologica Sinica 2012 (2). The stone artifact assemblage included cores, flakes, chunks, choppers and chopping tools, and picks, which were mainly made of quartzite, silicarenite and siltstone. The size of all artifacts was large and most of the tools were retouched on pebbles. The characteristics of these stone artifacts showed very strong ties with the pebble tool tradition of south China. The stratigraphic observation on vermiculated red soil and the comparison of dating with tektites suggest that these newly discovered localities were formed in early stage of Middle Pleistocene. These three localities were buried in the same layer of vermiculated red soil. Preliminary analysis illustrates that they show similar technological features, distribute across a broad area and span a limited time range. “With these details, a future project with a good stratigraphic and chronological control will be conducted to study the human behavior at open-air sites in south China”, said study co-author and research designer GAO Xing, a professor of the IVPP. This work was supported by CAS Stategic Priority Research Program-Climate Change: Carbon Budget and Relevant Issues, National Natural Science Foundation of China, and Basic Research Projects of MST of China.